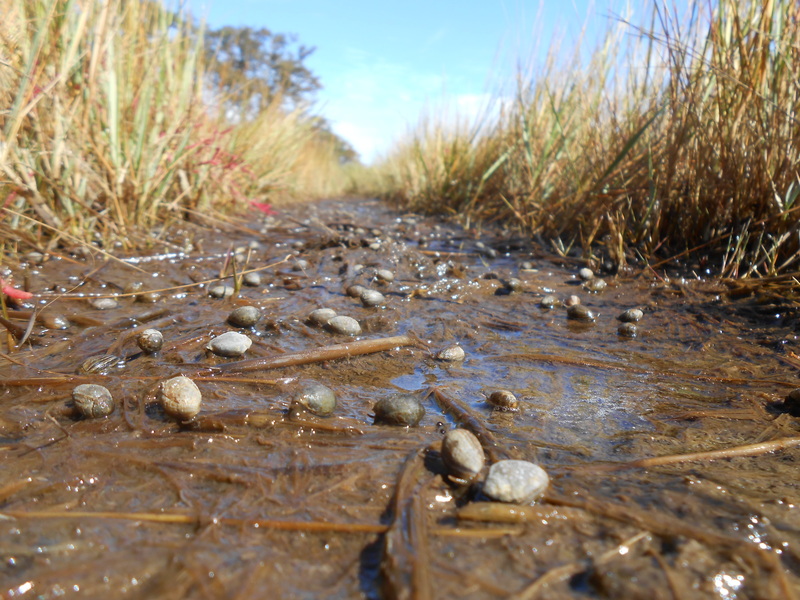 Galloping hordes of marsh snails! 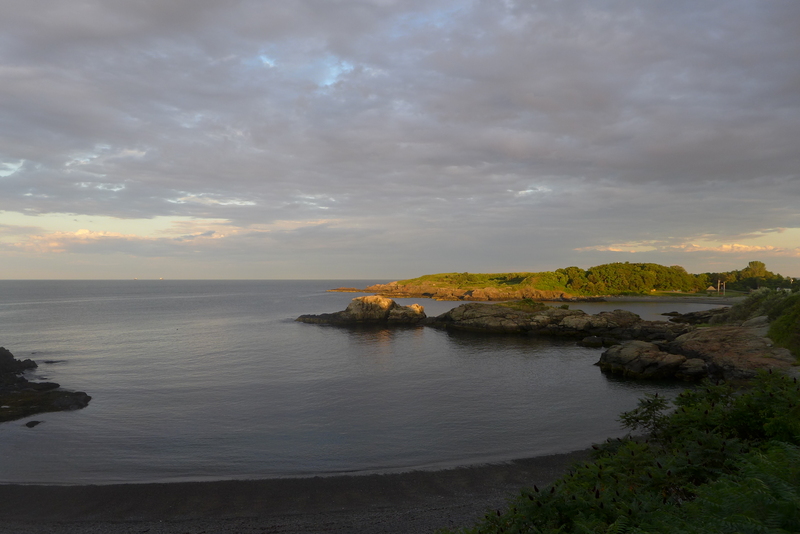 I have just returned from the New England Estuarine Research Society meeting in Groton, Connecticut (don’t be jealous). 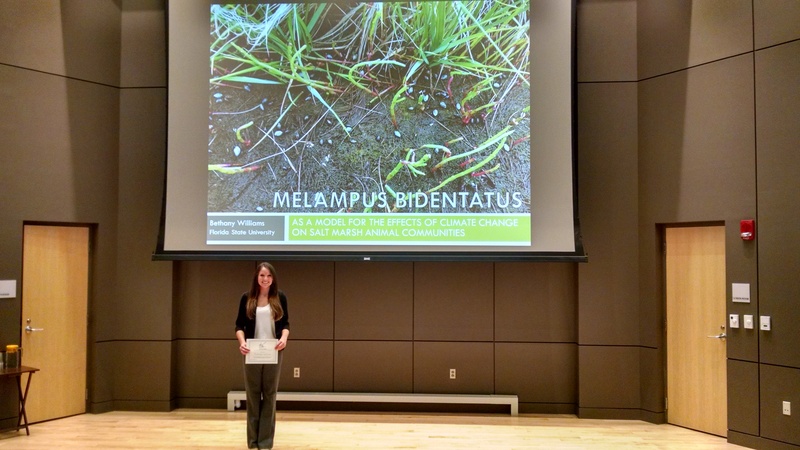 One of my students, Bethany Williams, gave a talk on the coffee-bean snail, Melampus bidentatus, and the effect of sea-level rise. I don’t want to give any spoilers, but as the salt hay in the Great Marsh is lost as sea-level rises, it could be bad news for the snail. But in sunnier news, Bethany, an undergraduate from Florida State University, gave her first talk ever and won best Undergraduate Oral Presentation! Very exciting! Congratulations Bethany! 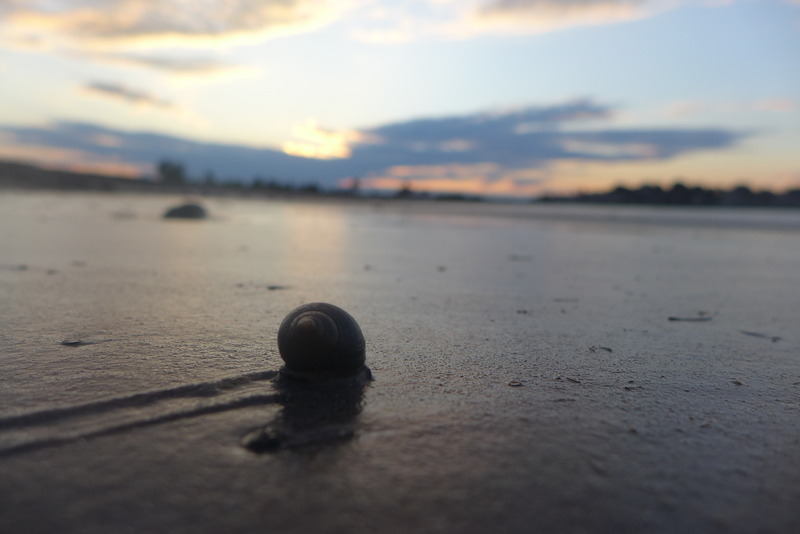 Below is time-lapse video of snails moving in and out of an abandoned footpath in the marsh. 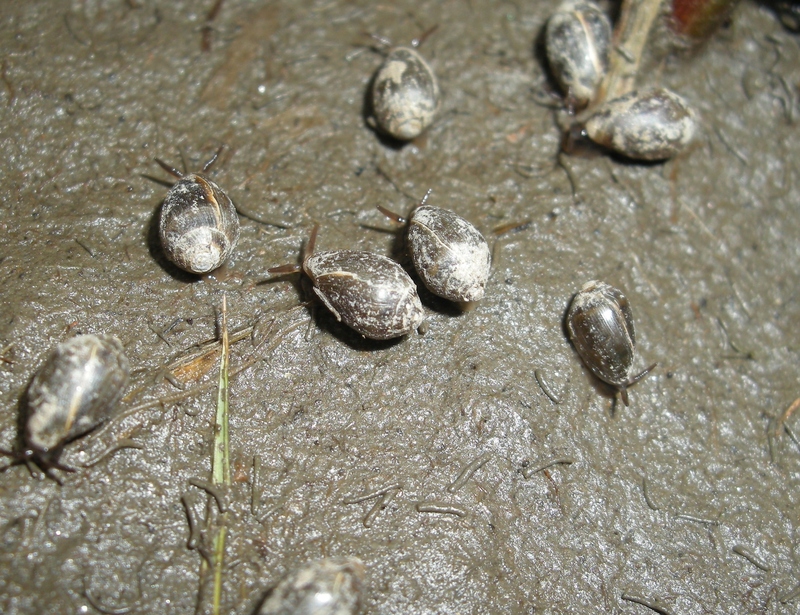 It demonstrates how snails avoid the path during the daytime heat, but when the temperature lowers and the humidity rises they gallop out from the grass to gobble the algae in the open. When the sun (and the heat) returns they ebb back into the grass. 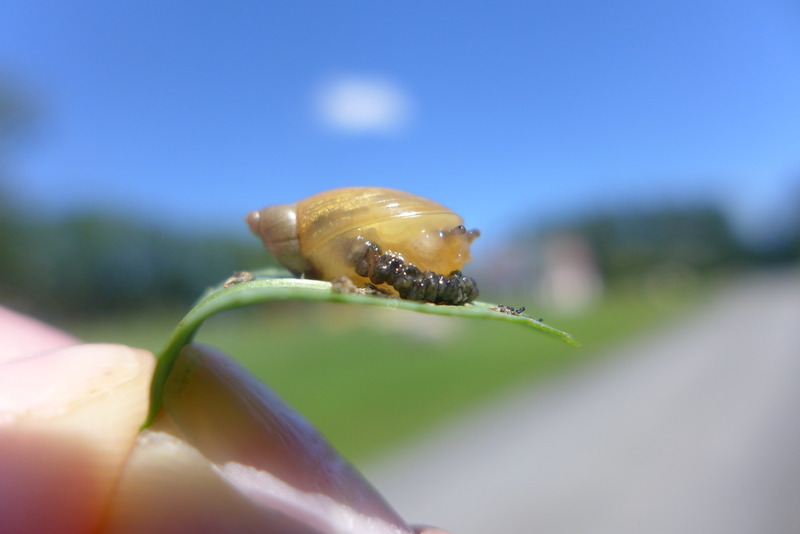 It’s a cool video that demonstrates potential impacts of climate change on these, turns out, sensitive snails. When Bethany’s thesis is complete, we’ll post more of the story. For now, enjoy the video. I wade into a marsh pond and see a funny speck of dirt crawling on the surface of the water. But on the underside of the water’s surface . 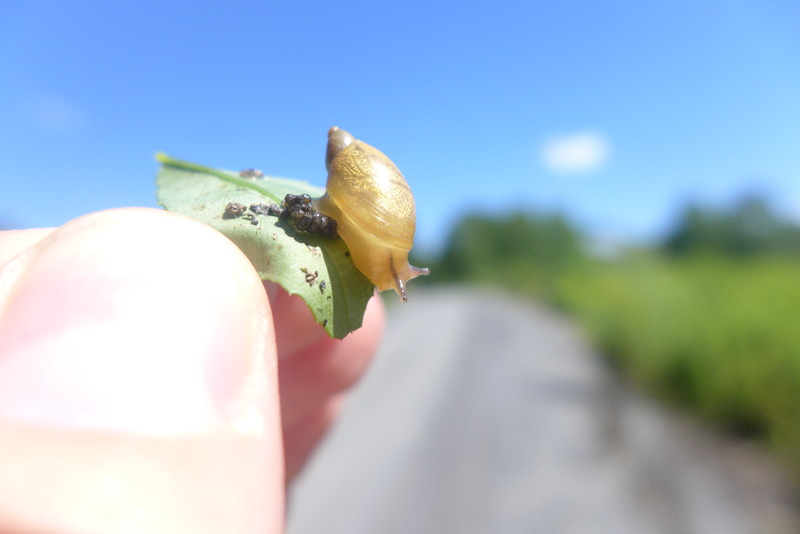 And it’s not dirt, but a minute snail from the family Hydrobiidae. This particular snail is not content enough to walk with its stomach foot on the ground or the plants, but to fancy itself on the underside of the water’s surface. If you are small of mass, gravity pulls on you very weakly. If you are small enough and a snail, you can spread your stomach-foot out wide and can take advantage of the water’s surface tension to walk on the ceiling. But first you must get to the ceiling. This minute snail can simply crawl up the side of the pond bank or a plant stem. Or create a tiny bubble of air to carry it up to the water’s surface. Often they will do this when it gets to crowded on the bottom. How nice it would be to simply create an escape bubble anytime you were uncomfortable. I cannot walk on water, on the surface or underneath, and my legs create tsunami sized waves relative to the tiny water-walker as I walk. The snail’s grip on the surface relinquished and it sinks awkwardly to the bottom, like a coin dropped in a bucket of water. Now it must decide how comfortable it is and whether to stay on the bottom, or rise to the top. Hydrobiid snails in a petri dish. One on the underside of the water’s surface, the other on the bottom. For those of you who haven’t seen it, here’s my article in the Daily News about how the coffee-bean snail survives a New England winter. Harriet is simply thrilled to have her picture taken; especially when squatting in mud and plucking snails. Mentor and mentee sorting samples. There are so many stories from the Great Marsh (the thumbprint of marsh bordered by the rocky shores of Cape Ann to the south and the sandy beaches of New Hampshire to the north) and it’s wonderful when they are written down. The one below is from Harriet Booth, a recent graduate of Brown University, who also had the great pleasure of being one of my interns in the summer of 2012. And bless her heart, not only did she survive a summer in the boot-sucking mud and pain-in-the arm, face, and leg flies, but she went on to write an honors thesis. Recently, she wrote a wonderful blog post about her experience, some of which is excerpted below. 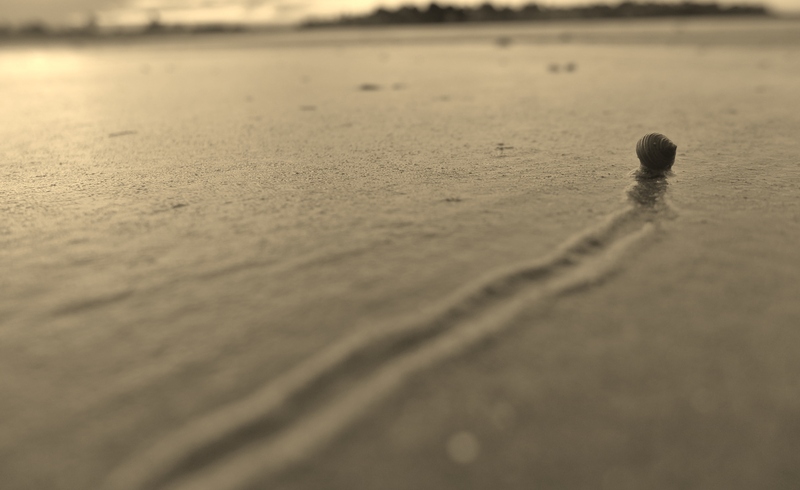 I particularly like “…a small snail, muddy-colored and roughly the size of a peanut, emerged from the edge of the plastic, making a bid for freedom across the mudflat.” I encourage you to read the entire essay here. Harriet is currently a Research Fellow at the Atlantic Ecology Division of the EPA in Narragansett, RI. She is looking at the effect of ocean acidification on bivalves. Way to go, Harriet!